Editor's note: I could have spent weeks working on this story. Al Schottelkotte's history and legacy -- like his name -- are long and well-known in Cincinnati. This is just a summary of some key moments, particularly those we've preserved in the WCPO Vault. CINCINNATI -- "That's it for now. So until tomorrow, may it all be good news -- to you." That's what Al Schottelkotte wished Tri-State families each night for 27 years. From age 16 to the day he died, Schottelkotte worked, in some capacity, to get the news to the residents of his hometown. Twenty-one years ago on Christmas Day, Schottelkotte died in his Lawrenceburg home. He was 69. He was still working at the time of his death; in fact, he was named chairman of the Scripps Howard Foundation board three weeks earlier. Schottelkotte grew up in Cheviot. He started his career in news on his 16th birthday while he was still a St. Xavier High School student. He was hired as a copy editor for The Cincinnati Enquirer, according to an obituary on the E.W. Scripps Co. website . During World War II, Schottelkotte was promoted to replace staff reporters who went off to war, he said. "The city editor looked up one day and didn’t see any other warm bodies in the newsroom. They were all off to war," he said . Schottelkotte himself would go off to war in 1952 -- to Korea. It took him away from his news day job, but it led to a gig in broadcasting. Schottelkotte began broadcasting a nightly news report on WSAI-FM, according to his obituary . The radio job was inspired by his experience in the army, where he took it upon himself to update fellow servicemembers on current affairs. Schottelkotte's nightly radio report was "the first local news program to make regular use of taped reports and interviews," according to the obituary . Six years later, Schottelkotte took his first TV job, at WCPO-TV. He was 33. 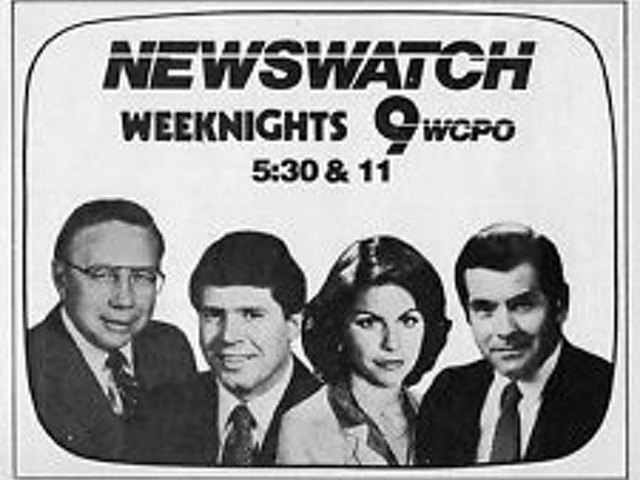 WCPO was an ABC affiliate at the time -- as it is now -- and broadcast on Channel 9. Schottelkotte began as the 11 p.m. anchor. The show would soon be called the "Al Schottelkotte News." He continued writing and broadcasting over the radio for several years before plunging head-first into television news. 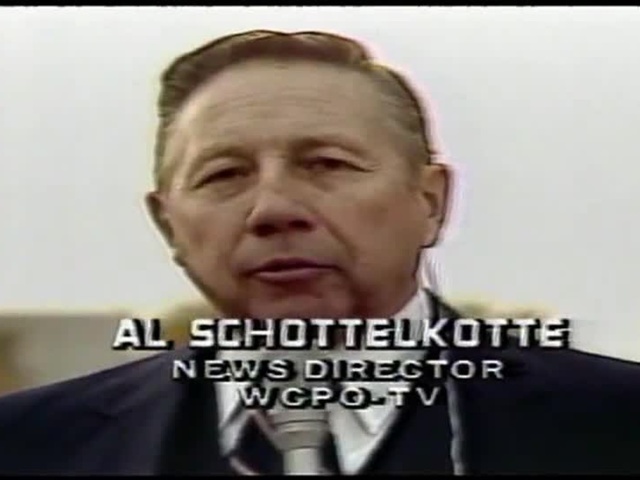 In 1961, Schottelkotte was an anchor, news director and special events producer for WCPO. While his career eventually turned to the Scripps corporate office, Schottelkotte remained an anchor for the station until 1982. After that, he still continued to produce the "Spotlight Report" until 1994. On air, Schottelkotte delivered the most jarring news of two decades of Cincinnati households: He reported on . Schottelkotte even became part of the story on several occasions. In October 1965, Schottelkotte helped free a Roselawn man from a Mexican prison. Noel Winston Menifee was 21 when he was arrested while driving with three friends from Ohio University. Schottelkotte was contacted by Menifee's mother and sister. He connected with Menifee, "concluded the charge was bogus," and decided to do what he could to free the Princeton High School grad, according to Greg Noble's From the Vault story . Schottelkotte and WCPO chief photographer Frank Jones filmed the tearful reunion between Menifee, his mother and sister. They flew all three back to Cincinnati with them on a Scripps-owned airplane. In December 1973, a Rembrandt painting stolen from the Taft Museum was returned on live TV -- to none other than Schottelkotte. "The story had all the makings of a made-for-TV movie – a whodunit with a few bumbling thieves; ransom demands and threats; a mysterious, smooth-talking intermediary, and two art treasures by one of history's foremost painters – only it was real and played out live on Channel 9," Greg Noble wrote in his From the Vault story about the event. In October 1980, Schottelkotte's newsroom was held hostage for several hours when an armed gunman came into the building, demanding a live, on-air interview. The gunman, James Hoskins, admitted to killing his girlfriend and went on a rant about race, poverty, anarchy and drugs. He later killed himself in the WCPO newsroom. Schottelkotte broadcast the day's newscasts from the WCPO parking lot via a borrowed satellite truck. Elaine Green, the reporter who interviewed Hoskins at gunpoint from the WCPO parking garage, would go on to win a Peabody award for her 14-minute interview with the gunman. High-impact news aside, Schottelkotte's style of journalism also blazed a trail for future generations of newsrooms. Schottelkotte made WCPO the first local television partner of CNN. He also purchased the WCPO Newsbird -- Chopper 9's predecessor -- which was "one of the first helicopters in TV news capable of live transmissions from the air." Scripps described Schottelkotte's style of directing as "heavily-rely(ing) on film, videotape, photos, Polaroids and a library of 50,000 slides of local landmarks and people." The company even says Ted Turner, founder of CNN, copied Schottelkotte's style of news for his network. Schottelkotte also developed the first half-hour, noon newscast in local television history, according to Scripps . Schottelkotte also had cameo roles on the television shows Gunsmoke and Gilligan's Island in 1964 and 1966, respectively, according to imbd . Schottelkotte died of cancer. He was survived by 12 children -- six sons and six daughters -- as well as two stepchildren, according to his obituary . At the time of his death, he was married to Elaine Green, (the reporter who interviewed gunman James Hoskins live on television in 1980) who went on to run a television production company.